Fabric squares! An entire year passed by between cutting out these squares and actually sewing them together. It's a long story. After cutting out the squares, I put them all in a back and randomly picked them out one at a time and arranged them in rows. Then I moved a few around to avoid having two of the same color together and to purposefully spread out the yellow and red squares. When working on a quilt project it is important to have a space that has lots of natural light (during the day, at least!) and lots of room to spread out your fabric pieces so you can see the end result before you start sewing. I chain-sewed all of the squares together in two, then sewed the pairs into strips and then sewed the strips together to complete the patchwork. 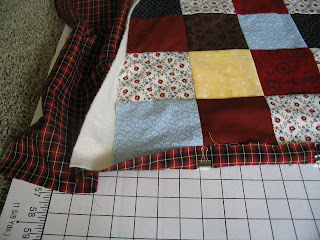 I chose a soft plaid fabric for the back of the quilt and sandwiched the batting between the layers. Binder clips do a great job at holding the layers together. I also did my best to line up the plaid with the seamlines between the squares. Plaid can be tricky to work with that way. Once the layers were sandwiched in place and secured, I hand-stitched the "ditch" down the center lines.